who specialised in painting the flora of the Amazon Forest. ​She also made a significant contribution to the worlds of science and conservation. This page is an introduction to Margaret Mee (1909 - 1988) and will be of interest to botanical artists and all those who enjoy botanical art. It provides links to online sites providing details about her life and work and exhibitions and books where you can see her paintings. Margaret Mee was a petite English lady and botanical artist who produced hundreds of botanical paintings as a result of her exploration of the flora of Brazil, along the River Amazon and in the Amazon rainforest. She follows in the traditions of the great lady botanical artist explorers! In 1952, age 42 she left England to go and live in the Amazon. Age 47 she started to explore the Amazon where she studied and painted the plants and flowers of the Amazon rainforest for the next 30 years. She also found and recorded new plants which are now named after her. Childhood: Margaret Ursula Mee was born on 22 May 1909 in Whitehill, Chesham - in the Chiltern Hills area of Buckinghamshire. She grew up there and was known to her family and friends as Peggy. Her aunt, Ellen Mary Churchman was an illustrator of children's books and encourage the young Peggy to develop her artistic talents as an artist. The School of Art, Science and Commerce,Watford. She then taught for a short while in Liverpool. After WW2, she she enrolled as an evening student at St Martin's School of Art, Westminster. Subsequently in 1947 she attended at the Camberwell School of Art (1947-49) where she was taught by Victor Passmore. She earned a National Diploma in Painting and Design. She married Reginald Bruce Bartlett in January 1936 (age 27). She and her husband were committed trade union activists with the Union of Sign, Glass and Ticket Writers. They divorced in 1943 after a long separation. In 1937 she addressed the TUC and proposed the raising of the school leaving age. She met her second husband Greville Mee at St. Martin's School of Art in London. She changed her name by deed poll to Mee in 1952. They married in 1980. Age 42, she moved with Greville Mee to Brazil in November 1951. Initially she taught art at St Paul's, the British School in Sao Paulo. The two of them began to explore the country on various expeditions and she decided to start painting plant portraits - and became a botanical artist. (see below for further details). Her other claim to fame is that she was one of the first people interested in environmental issues who highlighted the impact of large-scale mining and deforestation on the Amazon Basin. She won the acclaim and support of many other environmentalists. Very sadly, Margaret Mee died as a result of a car crash in Leicester on 30th November 1988. A memorial service was held at Kew on 16 January 1989. Those attending included representatives of the Duke of Edinburgh, the Brazilian government, and the world of botany. an awareness of the importance of conservation of habitat in the Amazon rainforest. 1994 (post mortem): 3,000 dancers paraded to a Margaret Mee theme at the Rio Carnival! ​Margaret Mee - Wikipedia, the free encyclopaedia - Margaret Ursula Mee (1909 Chesham, England - 1988, England), was a botanical artist who specialized in plants from the Brazilian Amazon rainforest. R. Schultes, 1990, "Margaret Mee and Richard Spruce", Naturalist, 115: 143-148. For 30 years, Mrs. Mee devoted her life to traveling up the Amazon River and its various tributaries. She would head up river into a small boat by herself, with only a local pilot for companionship, occasionally with a friend or two. Mrs. Mee was not simply a traveler and explorer of new places; she was a painter who tried to create a unique record of the rare species of flowers of the Amazon Basin before they disappear under the onslaught of man. Her work has been compared to some of the masters at painting from nature. Age 47 she started to explore the Amazon where she studied and painted the plants and flowers of the Amazon rainforest for the next 30 years. Between 1956 and 1988, she made 15 expeditions to the Amazon. Her intention was to record rare Brazilian plants. She specialised in painting orchids and bromeliads. It's notable that a number of the species she painted had not been recorded before. ​Nine plants recorded in paint by Mee were previously unknown to science - and they are now named after her. She was commissioned to illustrate the Flora Brasilica. This was very ambitious project to catalogue and illustrate the plants of Brasil. This involved working expeditions to various parts of Brazil. Mee learned to live with the forest and its plants, animals and people. She learned a lot from the Indians about the trees and plants which she then painted. She is also well known for support of conservation. Besides her paintings, one of her lasting and hugely important contributions to conservation is that she alerted people to the exploitation and destruction of the Amazon rain forest in the 1970-70s due to the development of the Trans-Amazon Highway. BBC - Radio 4 - Woman's Hour -Margaret Mee - The Mother Theresa of the rainforestsBritish born Margaret Mee spent over thirty years, from the 1950s to the 1980s, drawing the flowers and plants of the Brazilian rainforests; many of which are now extinct due to deforestation. Margaret Mee - in pursuit of the moonflower cactus | Kew Library Art and Archives Blog - the exhibition at Kew features a series of Margaret Mee paintings of the rare moonflower cactus, documenting her intrepid exploration for this elusive flower across the Amazon. It includes a foreword by the Duke of Edinburgh. It's regarded as the best published account of her life both in the UK and the Amazon. If you had to choose between this one and the 2004 abbreviated version, this is the one to buy - albeit it will probably cost you a lot more for one "as new" as opposed to a used book. The latter can be had for much reasonable sum. Includes 134 colored paintings and sketches of over 100 species of Amazon plants. This book - published in 2004 - is an abbreviated version of the book published in 1988 which has been out of print for some time (see above) . It contains Margaret Mee's detailed diaries kept between 1956 and 1988 plus several maps whch show the routes of her journeys and work sites quite precisely. The video below was made in Brazil - with a commentary from Alvaro Nunes - for the Senate TV during a commemorative exhibition in the National Museum in Brasília. Mee had a long held ambition to illustrate a Moonflower (a night-blooming cactus) - and was ultimately successful in her quest. In the early stages an extraordinary sweet perfume wafted from the flower, and we were all transfixed by the beauty of the delicate and unexpectedly large bloom ... Our vigil was long and I conclude that our intrusion had deterred the pollinator, upsetting the delicate balance between the plant and the animal which has taken tens of millions of years to evolve ... With the dawn the flower closed and we watched fascinated and humbled by the experience. Margaret Mee and the Moon Flower from Malu De Martino on Vimeo. This is the latest version of the original book. 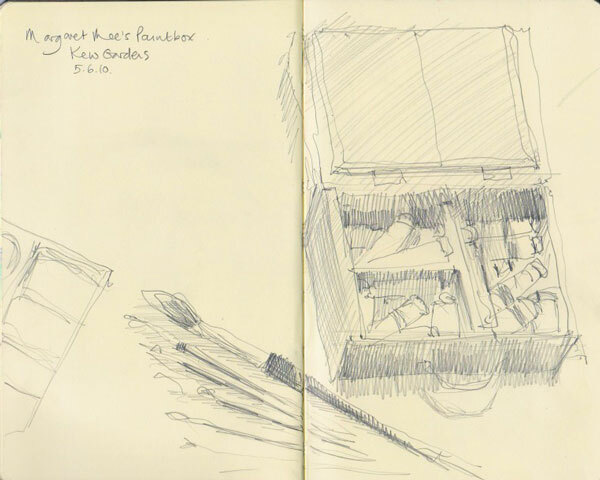 This book illustrates more than sixty of Mee's major works with additional sketches painted whilst in the forest. The text is taken directly from the diaries she kept whilst travelling giving a wonderful insight into the Amazon. Her first expedition to the Amazon was in 1956. She continued to travel throughout the wildest parts of Amazonia for the next 30+ years and produced paintings of the flora she found. Shortly after her first exhibition she became a botanical illustrator at the Instituto de Botanica de Sao Paulo. ​Much of her work recording the flora of Brazil on behalf of the Institute remain remains in the archives of this Institute. Prior to her death she developed a collection of her excellent examples of her works which she called "The Amazon Collection". Initially, the paintings were exhibited at the Missouri Botanical Garden who then also stored them for a period. Eventually they were purchased by the Margaret Mee Amazon Trust and archived at Kew Gardens. She preferred to sell her works privately. She always worked from observation of plants. She initially sketched the plants in the forest in pencil. She painted in gouache on a paper called Fabriano Raffaello which was reputedly an excellent surface for gouache. She also used Schoellershammer​ paper. As she became more and more concerned about the impact of deforestation on the Amazon habitat and flora, she started to emphasise the need for conservation of habitat. She did this by including the natural habitat in the background of the paintings. She hoped this would demonstrating the link and inter-dependency of plant and environment. essays by Simon Mayo, Brinsley Burbidge and Shirley Sherwood. Her work was acclaimed internationally by botanists and art critics alike. 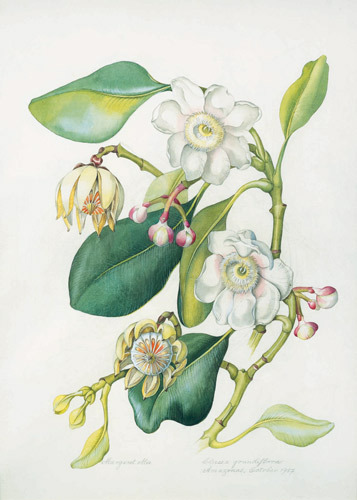 "...they are splendid, magnificently composed, superbly reproduced... can stand without shame in the high company of such eighteenth-century masters as Georg Dionysius Ehret and Redoute"
​In 1960, she exhibited her paintings at the Royal Horticultural Society Botanical Art Show in London where she received the Grenfell medal. After this she was able to work as a freelance artist. In 1964 she exhibited her paintings in Washington. 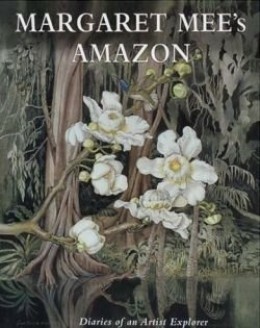 Exhibition and launch of the first major publication of paintings of Amazon plants in a book called Flowers of the Brazilian Forest, Collected and Painted by Margaret Mee (1968). This was a folio edition of thirty-one paintings. The Duke of Edinburgh (another well known conservationist) agreed to be a patron of the venture. Flowers of the Amazon: Watercolours by Margaret Mee. 58 paintings - painted for her second books Flores des Amazonas - Flowers of the Amazon. 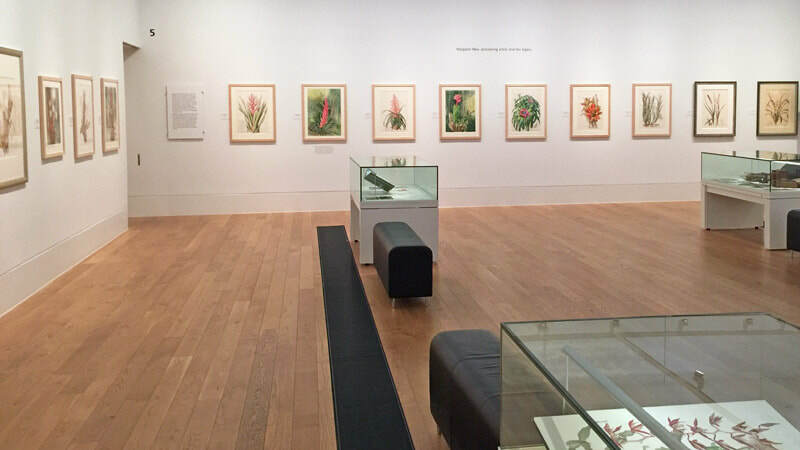 Hunt Institute of Botanical Documentation - The Flowering Amazon: Margaret Mee Paintings from the Royal Botanic Gardens, Kew. 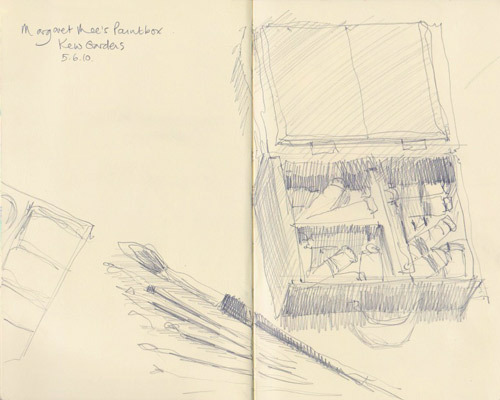 (12 May 2005 to 31 July 2005) - a travelling exhibition of thirty watercolor drawings and field sketches. Arizona Sonora Desert Museum, Tucson, Arizona. View all illustrations in the catalog by Margaret Ursula Mee. five paintings belonging to the Brazilian Academy of Science that illustrate the caatinga regions. a video with an interview granted by the artist to an American TV show, a few days before her death in a car accident. both the Shirley Sherwood Collection and the Kew Collections. paintings by Alvaro Nunes - who also spent a huge amount of time travelling and working in remote areas of Brazil. The Margaret Mee Amazon Trust was being set up by Margaret Mee prior to her death. The intention was that it should purchase the Amazon Collection and assist Brazilian botanical students to study in the UK. The Trust was eventually founded in 1988. The Margaret Mee Amazon Trust was officially launched, in the presence of the artist and her husband Greville, on the 9th November 1988 at the preview of the exhibition of the Amazon Collection at Kew - just three weeks before age died as a result of a car crash.